Obama Tells F.B.I. Not to Monitor Mosques. 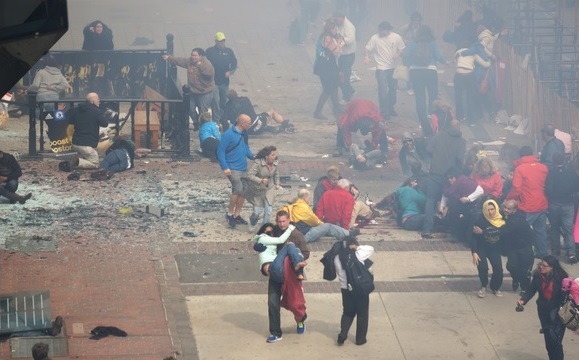 Feds Missed the Boston Bombers. A recent report in Investor’s Business Daily says that mosques are excluded from the surveillance dragnet operated by the government. If this report is true, then that begs the question: If surveillance is purposed to stop terrorism, then why would the government exclude mosques from examination? Who is this review committee? Nobody knows the name of the chairman, nor of the members and key staff. Apparently, says the report, these limitations were set up from pressure by Islamic groups. Just months before the panel’s formation, the Council on American-Islamic Relations teamed up with the A.C.L.U. to sue the F.B.I. for allegedly violating the civil rights of Muslims in Los Angeles by hiring an undercover agent to infiltrate and monitor mosques there. I.B.D. goes on to describe that, “The F.B.I. never canvassed Boston mosques until four days after the April 15 attacks, and it did not check out the radical Boston mosque where the Muslim bombers worshipped. The I.B.D. report continues: Before mosques were excluded from the otherwise wide domestic spy net the administration has cast, the F.B.I. launched dozens of successful sting operations against homegrown jihadists — inside mosques — and disrupted dozens of plots against the homeland. One of the Muslim bombers made extremist outbursts during worship, yet because the mosque wasn’t monitored, red flags didn’t go off inside the F.B.I. about his increasing radicalization before the attacks. If only they were allowed to continue, perhaps the many victims of the Boston Marathon bombings would not have lost their lives and limbs. What other five-alarm jihadists are counter-terrorism officials missing right now, thanks to restrictions on monitoring the one area they should be monitoring? 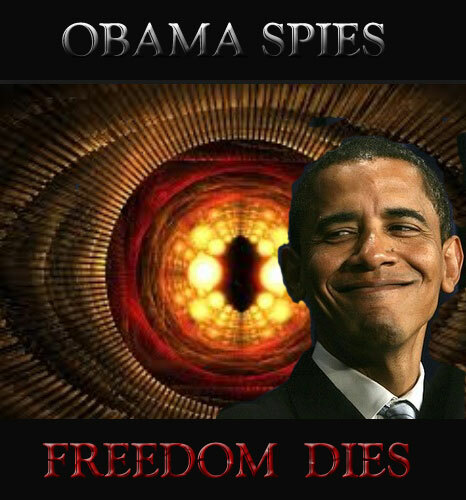 These warrantless spy programs only slanderously pre-judge all American citizens as guilty until never proven innocent, and fraudulently accuse them of crimes without any evidence to do so, so they are not really valid laws at all, but are crimes in themselves. As for being a “realist,” anyone who asserts: “I DON’T CARE ABOUT THEM SPYING ON ALL OF US, BECAUSE I HAVE NOTHING TO HIDE!” well, it seems to me that means they Submit to the notion that the ends can justify the means, when in fact the means really only define the end results: If and when you choose to lie, murder and rob others “to get ahead,” then, in the end, you’re not a “great success” – you’re still really only a lying, murdering thief! The only ends which justify using otherwise criminal means are of defense of one’s self and of innocent others. Once another attacks first (and also, note that all threats are psychological attacks – i.e: intimidation, bullying, coercion, duress, harrassment, extortion, and “terrorism” to name only a few synonyms) then the sub-sequent conflict isn’t limited to the predatory criminal aggressor’s whims – it’s over when the wronged party says it’s over. Morality depends on situational circumstantial sequencing, it’s not a context-free, nor situationally “abstracted” idol. But their “realism” stance doesn’t work in regards to the topic of this article: the NSA has no real need to spy on everyone. The problem of us being at war with the terrorists (we are not “at war against terrorism,” although we probably should be, but then that would mean exterminating our own corporazi sales-masters and their politician sales-puppet “leaders,” too, those who terrorize everyone on a daily basis by advertising fear in order to sell us the ‘greedy’ relief from their own initial threats) is that, while we are at war with islamic terrorism, and really only because it is at war with us – islam declared war on humanity (literally and precisely, too) 1,400 years ago. Islam isn’t a “religion” (at all, much less one “of peace”) nor are it’s “moslem” members a “race” (at all, much less one of poor, oppressed, “People Of Color”) – “our leaders” will sacrifice our lives and the economic futures of our children, to maintain the lie that we are NOT at war with islam, simply in order to keep the cheap oil (which is a “need” because literally everything is made from it) flowing. So they assist the moslems in extorting from us endless costly “security” measures like this NSA debacle, and costly airport screenings, singling out toddlers and molesting grandparents, simply to maintain their favorite lie and to keep the oil-money bribes flowing, and to save only their own worthless skins from being firebombed, beheaded or otherwise jihaded by their so called economic partners. They – these self-determined “government Authorities” – are attacking us all first, committing crimes against us, and blaming us victims; there is no way the ends here (total self aggrandizement and power-grabbing) justify these criminal means being used against us all, and in favor of our declared enemies. The reason they used to shoot cowards is because they are also traitors. The Constitution defines treason as giving aid and comfort to the enemy. 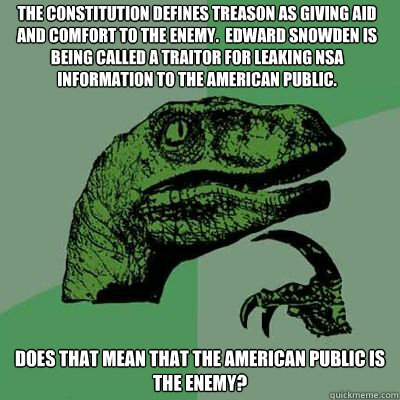 Edward Snowden is being called a traitor for leaking NSA information to the American public. DOES THAT MEAN THE AMERICAN PUBLIC IS THE ENEMY? 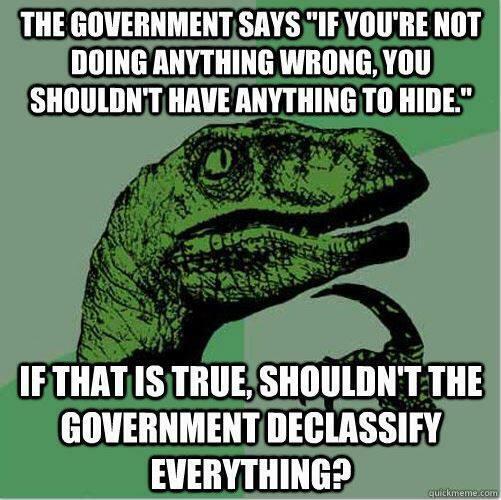 IF THAT IS TRUE, SHOULDN’T THE GOVERNMENT DECLASSIFY EVERYTHING?